1) I learned the hard way that the most important factor in choosing lodging in Paris is not how fancy the rooms are, the length of the room service menu, or even the price, but the proximity to a Metro stop. This is particularly true if you are traveling during months when snow or rain are common. After a long day of walking the city, when you are loaded down with heaping bags of brand new Louis Vuitton purses and Christian Louboutin heels, the difference between a one mile walk and a one block walk can make a huge difference! If you choose a place that is inexpensive but a long trek from a metro stop, your tired feet may eventually persuade you to skip the metro and opt for a taxi. This can add on an extra 50-100 USD per day to your travel costs, in which case you would be better off opting for the pricier but more conveniently located hotel anyway. Nearly all hotels will tell you that they are located close to the metro (which is partially true, as you’re never really more than a mile from a metro stop within the city), but your best bet is to pull up Google Maps and get directions from your hotel of choice to the nearest station (in Google maps, Metro stops are marked by a blue letter M in a white circle with a blue border). Map distances can be deceiving, so make sure to use the “Directions” feature (and make sure you set it to “walking” mode by clicking the image of the walking figure) to get the exact distance. I recommend staying under 300 meters when possible, but the shorter the better. Keep in mind that a meter is similar in length to a yard, so 300 meters is similar in length to three football fields. In addition to proximity to a Metro stop, proximity to a boulangerie or patisserie can be an unexpected but wonderful perk. It can actually save you a lot of money to be able to walk across the street and grab a couple of croissants or a baguette to fill yourself up in the morning, rather than spending a lot of money on a hefty breakfast or lunch each day, and you’ll feel more Parisien in the process. 2) Kayak.com is a great resource for finding hotels in any city, not just Paris. Kayak searches all the different travel sites like Expedia, Travelocity, Priceline, etc and shows you the cheapest offers available in one convenient place. You can also use Kayak to find inexpensive flights, car rentals, and cruises as well. However keep in mind that Kayak works only with hotels, and won’t show you other options such as bed & breakfasts or vacation rentals. 3) Most people will say that location is everything, but I find that is rarely true when it comes to where to stay in Paris. Because the attractions in Paris are spread so far and wide, no matter where you stay, you’re more than likely going to end up having to take some form of transportation to get back to your temporary home at the end of the day anyway. With the Paris Metro being so safe, inexpensive, and easy to use, no matter where you are is located, you’re never really more than a short ride from home. There’s certainly something magical about a view of the Eiffel Tower or a room overlooking the Seine, but if you’re on a budget, don’t be afraid to go with a room in a less touristy area. 4) Leave your American perceptions at home. Residences in Paris are often situated in older buildings, which means that rooms are typically very very small, have older windows that let in lots of ambient noise, and lack amenities such as air conditioners, closets, bathtubs, and elevators. Things that might be considered “dirty” by American standards – rusted metal, flaking paint, exposed pipes, unvarnished wooden floors, etc – are normal and expected. This is part of the charm and ambiance of Europe, and if you prepare yourself for things to be different and arrive with a flexible mindset, you’ll have a much more positive experience overall. 5) If you do plan to spend a lot of time in your room (honeymooners, older couples, or larger families may fit into this category) and you want to splurge on your hotel, I recommend opting for a suite with a balcony. There’s no better way to start a day in Paris than to sit out on a wrought-iron balcony overlooking the city and enjoy a warm fresh croissant and a cup of steaming hot coffee. If your feet are tired or you just need a few hours to yourself, curling up on a balcony with a newspaper or a good book is a wonderful way to recharge your batteries. Pass on expensive views of the Eiffel Tower, Sacre Cour, or the Seine unless you have a balcony to sit out and enjoy them on. 6) If you’re more of a “skip the tourist attractions, show me the REAL Paris” kind of traveler, then consider alternative options such as AirBNB or Couchsurfing that allow you to stay in an apartment or spare room of a real Paris resident. With these services, you sort through listings and then contact the owner directly to arrange your stay. If you want a private rental with the high-end feel of a hotel room, a good alternative is CobbleStay, which offers luxurious short term apartment rentals in the top neighborhoods. With these options, you’ll not only get your own private bedroom, living room, and bathroom, but also your own private kitchen (for storing all that delicious cheese and wine you purchase every day! ), and in some cases extra bedrooms or fold out couches, balconies or terraces, or private gardens, as well as free unlimited TV/internet/phone access. These options are often far more affordable than hotels, with small apartments available for only 50-60 Euro a night and high end apartments available for 200-300 Euro a night. Hotel Chopin is an experience in and of itself. It’s located inside a secluded historical shopping passage, nestled between ancient bookstores and antique shops. Everything about it is tiny, from the lobby to the staircase to the rooms themselves, but what it lacks in space it more than makes up for in charm and atmosphere. If character means more to you than convenience, you’ll adore the Chopin. Go for a larger and more brightly lit Classic room, pack light, and make sure to spend some time browsing the secret shopping passages around the hotel. One of the best values in Paris. Free wifi, TV, air conditioning, comfortable beds, a desk to work at, and a view of the Eiffel Tower – all for under 150 Euro. Decor is simple but the rooms are clean and well-appointed and the staff is lovely. There’s a charming breakfast area, and the area is full of lively bars and restaurants. The rooms here feel far nicer than the price tag suggests, with colorful and classic decor that is reminiscent of some famous French chateaus. The rooms are dark but lovely and have all the modern amenities you need – phone, TV, wifi, air conditioning, and elevators. The location in the heart of the Marais is great for atmosphere and very close to great shopping and dining. A steal for the price. One of my favorite hotels in Paris. The decor of this hotel feels like the embodiment of Sofia Coppola’s Marie Antoinette – classic French architecture drenched in pastel candy colors and whimsical modern touches. The staff is friendly, the drink & breakfast bars are well-stocked (and self-serve! ), the rooms are comfortable, and the location is convenient. A metro stop is only a few feet away, and the fabulous Opera Garnier (and the wonderful shopping and the major metro hub that surrounds it) makes it a great home base for exploring the city. I stayed here on my honeymoon and couldn’t have loved it more. Rooms start at 200, suites start at 550. A rare one-of-a-kind experience in the trendy Saint Germain. This hotel’s rooms are extravagantly decorated in unique and unexpected ways, from fiber-optic starry ceilings to levitating beds, but the real reason to stay here is for one of their seven magnificent suites. Each one has its own special name and theme, and the decor is over the top in the best ways. Though I’m sure the gentlemen will prefer the Bond-themed 007 suite, I suggest the Lovez-Vous with its own private fireplace, candlelit terrace, and hot tub for two. Rooms start at 200, suites start at 400. Located on Rue Cambon just beside Chanel’s original boutique and two short blocks away from the Rue Rivoli and the Tuileries, this hotel gives you a high-end feel without the high-end pricetag. If all you want is a lavish room and great service in the poshest neighborhood in Paris, this is the more reasonable alternative. The 24-hour room service is an especially nice touch in a city that often shuts down early. Rooms start at 300, suites start at 500. What makes this hotel so special is the abundance of choice. From room decor styles (classical or art deco) to restaurants (five options on the premises) to the mini-bar (80 items) to the turn-down service (six choices) to the glorious 35,000-bottle wine cellar, the Athenee goes to great lengths to customize your stay. What I love is the uniqueness of this hotel and the special touches that it make it so unusual, such as the adorable red bicycles the staff members spot around town as they run errands for guests and the breathtakingly romantic private ice skating rink during the winter season. Ladies will appreciate that Plaza Athenee has been the Parisian home-away-from-home of the world’s most fashionable women, including Grace Kelly, Jackie O, Anna Wintour, and of course Carrie Bradshaw. Rooms start at 650, suites start at 1700. 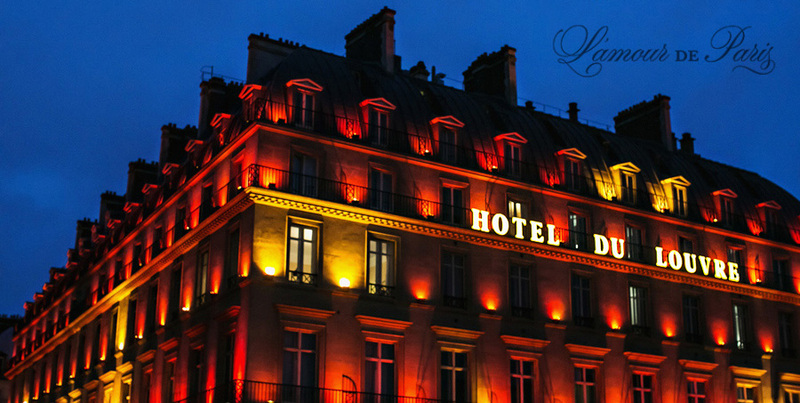 Famous for its appearance in the movie Midnight in Paris, this hotel is the ultimate in luxury plus location. Their doors open up to Rue de Faubourg Saint-Honoré — one of the main streets for high end shopping in Paris. A short walk from here you’ll find the famous Angelina’s Cafe, with the Louvre and the Tuileries just across the street, but between the award-winning spa and the three-Michelin-starred restaurant Epicure that spills out onto a stunning French garden, you may never want to leave. For first-timers to the city who want the five-star experience, Le Bristol is a great choice. Rooms start at 750, suites start at 1000. Whereas there are many luxury options for those who want classic French elegance, the Mandarin Oriental offers unparalleled luxury with a more modern flair. Rooms are sleek, trendy, and updated with all the creature comforts you need when you’ve had your fill of old and want to sink back into the new. Especially breathtaking are the gardens and terraces scattered throughout the suites, a rare treat in a tightly-packed city. Rooms start at 800, suites start at 1400. There’s no more romantic experience than cuddling together on a private candle-lit balcony overlooking the Eiffel Tower, and there’s no better place to make that happen than the Shangri-La. If romance and a breathtaking view are your top priority, and money is no object, look no further. Many of the rooms are decorated in a classic French style, giving you the feeling of your own personal Versailles. 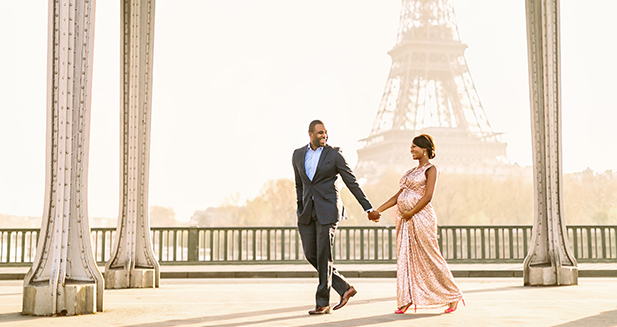 Their unique location places them within blocks of the Eiffel Tower, the Arc de Triomphe, the Champs Elysees, the Louvre, and the Seine, so it’s the perfect home base for an incredible vacation. Rooms start at 1000, suites start at 2000. This renovated red-brick mansion is a TripAdvisor darling, with over 200 “Excellent” reviews (and not a single review below “Very Good”). The rooms are spacious and cute, the owners go out of their way to make their guests’ experiences special, and the prices are fabulous. For those wanting extra privacy (or those traveling with a big entourage, you can even rent out the entire home for your own private Parisian mansion. This lavish manor home will have you truly feeling like French nobility. The words elegance, luxury, and romance all come to mind when you look at the grounds and interiors of this three bedroom home along the edges of Paris. Although a bit of a distance from central Paris (hardly an issue with the abundance of trains and buses running nearby), the Beauregard is a breathtaking respite from the hustle and bustle of Parisian life, and will inspire the imagination and fantasy of anyone who dreams of the old French lifestyle.